As sweet as cinnamon: Dear Jane too???? away at these few blocks from Dear Jane. I am not even liking the color I have chosen anymore. change you choice of fabrics. she too was slowly plodding away at her Dear Jane. just encouraging each other to do so many a week or month. We can finish that quilt, together.. Sharing and plodding through the Dear Jane journey together. Janiac's Unite was decided upon. that reflects us and what we are about. We are about uniting in the journey together with our Dear Jane quilt. Would you like to join us on our Dear Jane journey. will send you an invite to join the Janiac's Unite blog. One thing we ask is you post once a month at least. Post about your progress and blocks you have made. Encourage others to keep journeying. You can post more often if you want to, its up to you. We need to Unite and get those Dear Jane's finished. Below is the button for your blog sidebar if you'd like to use it. to your picture once it's on your sidebar. and seeing your fabulous quilt come together. This is a great idea Dawn, it really helped me keep on track when I was on the SAL blog. I've left a comment on the Janiac's Unite blog. I'm not doing a Dear Jane quilt, but your plan sounds like a winner!! Looking forward to seeing your progress!! i'm doing dear jane! but don't like my color choices for 'garden jane', yellows and golds alternating with greens. yikes! what was i thinking! i 'paused' at 27 after following a schedule i found on a dear jane site and decided i would go for rows instead. now, i'm still 'paused' and won't start up again until the mood strikes. :( but, if i may, i will follow your janiac's unite with great enjoyment ! I like the colors you are doing your DJ quilt in but like you I do change my mind when I am working on a project too. I just subscribed to your blog. Now I won't miss a thing. Yes, I'd love to - having the support really helped me with the recent SAL for Tis the Season. Hopefully this will, too. I've left a comment on the Janiac's blog and sent an email to Vicki. I'm not doing a Dear Jane quilt (yet), not even doing any stitching at the moment, but IF I would I surely joined the Janiac's! Clever girls you and Vicky are, Dawn! Great idea! I am planning on getting mine finished in 2012 (not quite halfway yet, but have been working steadily on it this month). A little encourage is so helpful - as well as a bit of accountability! This is great! 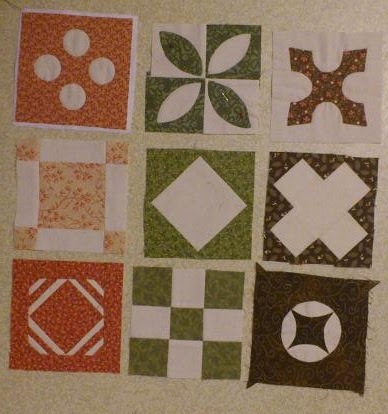 As I commented on Vicki's blog, I have been crushing on this quilt for a few months now, but have been put off by the sheer number of different little blocks ... and the thought of trying to do this by myself! With the prospect of doing this alongside other quilters I have now ordered my copy of the book, plus rulers, and eagerly await its' arrival in about a week! Ooh, ... that's two goodies to look forward to its arrival, lol! I am also a Dear Jane addict. Congratulations for your Blog. What a great idea- I'll pop over and have a look at the new blog! I am so tempted as I always wanted to do a "Dear Jane" but didn't feel that I would have the staying power. Hmm, let me think about it. Thank you for the great idea. you are going to be one busy little beaver Miss Dawny!!!! Good to hear that it's on the move though.....I don't mind the colours...wait till it's finished....labour of love will be aaaaaaalllll worth it! I'm not working on that one, but I think your colors are wonderful...very pretty together if you ask me! What fun! I love the blocks you have already made and look forward to seeing more! I'm very tempted to join in sweetie... very tempted!! !